This post contains some affiliate links. This means that if you decide to click through and make a purchase, I might (at no extra cost to you) receive a small commission that goes back in to keeping the blog going. Thank you for your support. They're cheap, and if you're lucky, fairly meaty - although I've had bad experiences with supermarket ribs in the past that were all fat and bone. Now I get them from an organic, free-range butcher and they're always lovely, with enough succulent, sweet meat you pull away from the bones with your teeth. And for the seasoning, I took a tip from Argentina and decided to keep it simple with garlic and parsley. In Argentina, you might hear the word 'provenzal' when describing a type of food. This will usually mean that at some point the food was marinated in garlic and parsley. So if you were being fancy, you could call this Costillas de Cordero a la Provenzal. 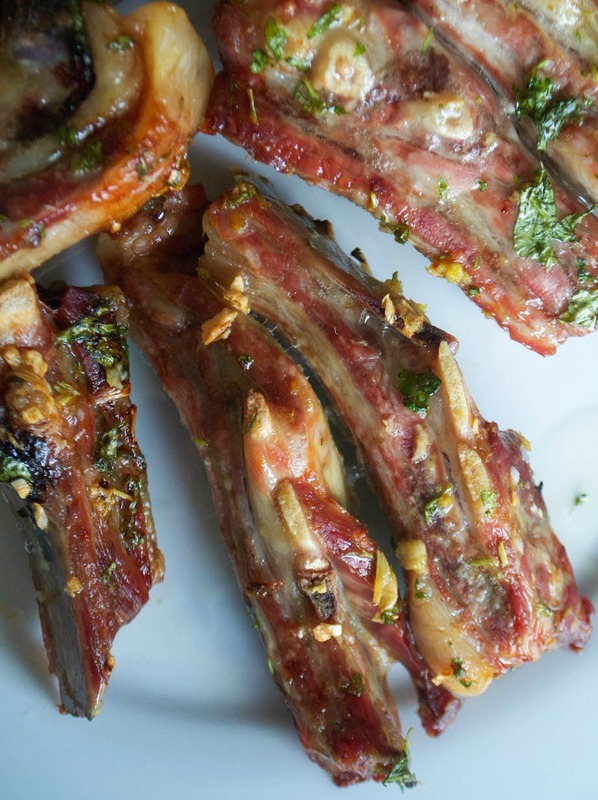 Lamb ribs with garlic and parsley. First, get your oven preheated to gas mark 6/200ºC/400ºF and get out a roasting tray. Take out the ribs and arrange them on the tray, in one layer if possible. Smear over the coconut oil - you won't need much, just a thin coating on the ribs - and then scatter over the garlic, parsley and salt. Using your fingers, get everything rubbed in well. Roast in the oven for 45 minutes to one hour, until the meat on the ribs is tender and the meat is golden and aromatic. This recipe has been linked up to Phoenix Helix's AIP Recipe Roundtable.